In addition to links to the reviews and maps that I’ve created, there are a few fields to tell people a little bit about myself. 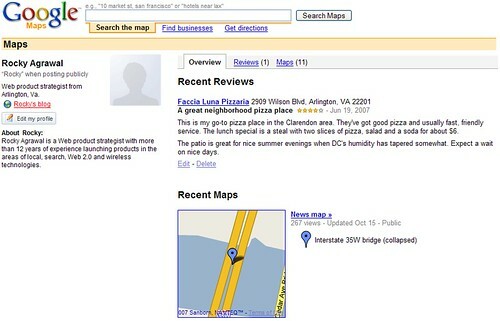 It’s not as robust as Yelp’s profile page, but it shows the beginnings of a social bent to Google’s local properties. People-friendly URLs. The URL for my profile page is http://maps.google.com/maps/user?uid=110282169465175925759&hl=en&gl=us. On Yelp, my URL is http://rocky.yelp.com. The option for people who use my maps to leave comments. The feedback options on flickr and Yelp are important drivers of continued participation; if I hear from people who find my work useful, I’m more likely to contribute. A Facebook application that distributes my maps and reviews to my friends. Google has already released a Google News application and a third party has created a Google Reader app. This entry was posted in facebook, google, local search, maps, social networking, yelp. Bookmark the permalink.